971 people who live, work or study in the Langside area responded to our survey about the future of the Victoria Infirmary site. The survey indicates a high level of public support for community consultation. The Victoria Forum is campaigning for public consultation to take place before a sale is finalized. 75% were concerned about the sale and re-development of the site and 68% thought it important that they should be consulted about it. 63% thought that the sale and associated planning applications should be put on hold to allow fuller pre-sale consultation to take place and 322 individuals want to be ‘actively involved in representing their community, to help shape the detailed proposals’. You can read the full results here (pdf). The site is now up for sale for ‘residential and supporting uses’ through Savills with the 9.5 acres site having ‘capacity for 500 homes’. A closing date of 10th March has been set. Asked about development options 71% favoured only selective demolition of the less important buildings with 81% rating highly the architectural importance of some buildings on the site. At present the only listed building on site, guaranteed retention, is the Grade B listed Administration Building. Views were mixed on the type of buildings to be erected on site; of the nine options suggested, ranging from residential to offices, light industrial and retail, community (66%) and residential (53%) were the most strongly favoured options. Views were mixed on the preferred make-up of residential with private (owner-occupied), rented and residential care all receiving similar levels of support. 71% wanted to see some public space, accessible for community use within the 9.5 acre site. The variety of views could be explored and better understood in a community consultation. The Victoria Forum supports the sale and redevelopment of the former infirmary site. The Forum is not campaigning for a particular use or community benefit. It simply wants to ensure that the local community is properly involved concerning the options and long term impacts of the Victoria Infirmary redevelopment. Such a move would be consistent both with NHS policies on public engagement and with the spirit of the new Community Empowerment Act. In so doing help the maximum value can be obtained from the site. The Victoria Forum believes that consultation carried out as part of the planning process after the sale is finalized will be too little too late as key development and financial assumptions will already have been made. For me it was a shame that the traffic organization issue was not addressed by this survey. I find that the junction Sinclair Drive and Battlefield road is quite tricky, I can see it from my window and I observe that often cars have to pull on the junction blindly… It’s very chaotic and could be dangerous (especially for drivers of larger vehicles such as delivery vans, buses or trucks). Hm, are comments working here? Hi yes comments are working. Just takes a little while to moderate. Thanks for the interesting contribution! This is exactly what we mean when we say the redevelopment of the site is an opportunity to impact the whole area positively for decades to come. No online survey could have addressed this and thats why we are campaigning for deep community consultation before a sale is finalized. I too live locally and am concerned about the junction of Battlefield Road/Sinclair Drive. Like another contrbutor am amazed that there are not more accidents. I do wonder if slight rerouting of the No4 bus could be added to the already huge redevelopment of the Victoria site. WWhen the 4 bus leaves Sinclair Drive could it be rerouted up Battlefield Road, round Langside Monument, then down Grange Road aand then hence on its usual route. Going in opposite direction the 4 bus could turn sharp right at traffic lights into Battlefield Road in front of Coop and then first left into Sinclair Drive and conntinue as usual. This would mean the 2 bus stops outside old Victoria would be redundant but bus stops could perhaps be resited in Sinclair Drive itself. The old crossing junction going to and from Sinclair Drive could then be blocked off. This would create an open space which could perhaps become a small square with flower beds and some seating for the new occupants of the redevelopment and the local residents to enjoy. I don’t think if that proposed route change would be a good idea. That would mean bus going up and down battlefield road just to make an u-turn on the battlefield monument. In the morning, this road could be busy so the bus would loose quite a few minutes… That would really annoy me if I used that bus to get to work from, for example, Cathcart. 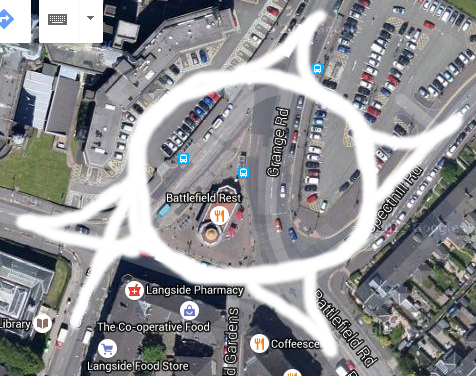 If the changes would be to be made, I would rather consider taking the 4 route via Langside road to battlefield monument and then through Milbrae road to turn left into Langside road, and to do it in both directions. 1. Bus would not serve front doors of the new hostpital, as the bus stops would have to be located on Langside road, which would require a 100 m or so walk, which can be hard for many patients. Further advantage would be that it would allow to scrap the traffic lights at the junction, which would make the traffic moving more smoothly, and, last but not least, by creating three bus stops at each side of this triangle-shaped roundabout, we would be able to stop all buses going in the same direction at the same bus stop, allowing for easier change. So the 4 bus route could stay as it is, with the only exception that the bus would go around Battlefield restaurant to get into Sinclair Road, and so buses 5 and 6 would have to go outside coop and then turn right to get towards Victoria road, and buses coming down from Battlefield monument would also make a small diversion around the restaurant. 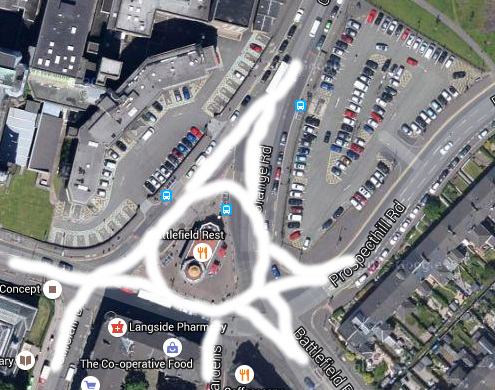 Also, if we are to think bold, what about trying to design a bigger roundabout? If a chunks of the car parks outside old hostpital and between Prospecthill and Grange Roads could be used, it would allow for really big one: http://i.imgur.com/vFvGoyM.png with plenty of room for some public space inside.